This report from Save the Children aims to dispel the myths underpinning the widespread use of orphanages and international adoption in response to humanitarian crises. It reveals the realities faced by children and families affected by conflicts and natural disasters and the organisations working to assist them. 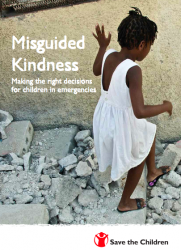 Most importantly, this report seeks to inform individuals, organisations and governments wishing to make the right choices about the care and protection of vulnerable children in emergencies.